White Moi Moi (Ekuru) is another way to enjoy beans. With a little alteration, it is suitable for vegetarians. White Moi Moi (Ekuru) is to regular Moi Moi what Agidi is to Agidi Jollof or what Boiled White Rice is to Jollof Rice. It is prepared the same way as regular Moi Moi but with less added ingredients. It gets most of its taste and colour from the stew it is served with. On its own, White Moi Moi is tasty due to the seasoning it contains so you can skip the stew and enjoy it with a chilled drink. The job of the vegetable oil is to help the Moi Moi come out of the container easily when done. About three hours before cooking the moi moi, soak and peel the beans. When done with step 1, put the peeled beans in a bowl and pour enough water to cover it. Leave to soak for three hours. This is so that the best consistency will be achieved when you blend the beans. Prepare Tomato Stew if you do not have some. Prepare the moi moi containers. Prepare some Smoked Fish and break into big chunks. Blend the beans with the onions and crushed stock cubes and pour into a big enough bowl. Please note that the total quantity of water to be used (for blending and mixing) should be 600 mls. Add the vegetable oil (if using it) and stir. Set some water in a pot to boil. The water should be about 1 cm deep. When the water boils, add some padding that will be a base for the Moi Moi wraps. Scoop the Moi Moi mix into your container of choice and gently place in the pot of boiling water. Repeat step 7 for the rest of the Moi Moi mix. When done, cover the wraps with some leaves or a plastic bag to keep the heat in. Check it from time to time and add small quantities of water at a time when necessary. 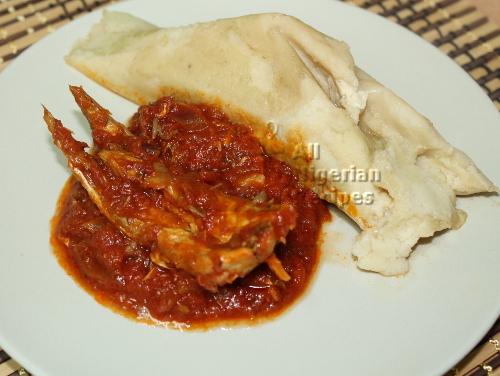 You can eat white Moi Moi with any tomato based stew, make sure the stew is seasoned with at least one traditional ingredient: smoked fish, iru, crayfish. This is how I prepare mine and it is so delicious, goes really well with the beans. Put the chunks of fish in a clean pot. Add the onions, some water, stock cube, pepper and nutmeg. Stir and start cooking. Once it boils, add the tomato stew. Cover and leave to simmer and it’s done! Serve with the stew or skip the stew and serve the White Moi Moi with a chilled soft drink.